Finally the intense uncertainty and anticipation that was building for the prophetic dates of 12/21/2012 has past, and we have entered into a new beginning that is a merging of our physical body with our spirit. The world did not end in horrific cataclysms; nor was there an ecstatic rapture into paradise. A fleet of UFOs didn't come to save us either. If you were hoping that the world would shift in an instant without getting up out of your "easy" chair, I am sure you are disappointed right now. Yet I know the sensitive ones of this world are now breathing a deep sigh of relief as the energy bubble, overflowing with crushing ambiguity and expectation, burst, and a more balanced, peaceful and harmonious energy has emerged to the Earth plane. Now what? It is time to get really friendly with the unknown that is out in front of us now. The world is going to change, and so are we. There are going to be some surprising changes in the directions in our physical and spiritual lives. Being perplexed by all the myriad of choices will be our constant workmate. We are struggling to get clear about what is next for our lives and our usual guidance is now coming from multiple directions at once . . . and to make to more confusing, all of this guidance feels to be true. We are learning to be multi-dimensional beings and think and live in multiple realties. This wrestling for clear guidance is going to stretch us and help us discover new frontiers of reality. It is time to quit expecting to be saved or rescued. We have now graduated into multi-dimensional grownups. It is time to re-claim our God given, divine potential, physically and spiritually. It is time to face life full on regarding the work ahead of us; to be responsible human beings and embrace the uncertainty and change in the enviable matrix of possibility ahead, and use it as a vehicle for our growth and awakening. Adversity and challenge will come to us when we fight the changes in direction and hold on to our rigid belief systems. I love the raw courage exhibited by author Elizabeth Lesser in her book "Broken Open". She wrote . . .
"Adversity is a natural part of being human. It's the height of arrogance to prescribe a moral code or health regimen or spiritual practice as an amulet to keep things from falling apart. Things DO fall apart. It is in their nature to do so. When we try to protect ourselves from the inevitability of change, we are not listening to the soul. We are listening to our fear of life and death, our lack of faith, our smaller ego's will to prevail. To listen to the soul is to stop fighting with life, to stop fighting when things fall apart; when they don't go away, when we get sick, when we are betrayed or mistreated or misunderstood. To listen to the soul is to slow down, to feel deeply, to see ourselves clearly, to surrender to discomfort and uncertainty, and to wait." We have entered a new beginning that has blasted us into a higher frequency. It was an explosion of spirit and evolution. Any negative ego driven program must and will go extinct. The past is quickly becoming a dinosaur. With patience, we will learn to understand and integrate the new higher frequencies that we are now learning to navigate. We may flip flop between the many choices out in front of us until we can hold and maintain a multidimensional perspective. We have the task of unpacking all that transpired during the powerful time of 2012. We have just come from a fever pitched and frantic ending of a huge cycle. Be patient with yourself now, as new cycles always begin slowly and deliberately. Each decision and choice will be made from great intent and deep contemplation. We have lots of time to think things through now. No need to rush. We didn't miss the boat; we are on it and sailing along with the spirit of the wind. Let us see where it takes us. Those of us that were in sacred areas of the Earth, over the 12/21/2012, were downloaded with powerful new codes of life and nature. We will assimilate what is coming quickly as long as we listen to our hearts. We will share these new codes with others, and it will spread across the Earth. Whoever and where ever you are right now, you are a part of this transformation. We will continue to understand these codes further as we travel through the remainder of the dark rift in the Milky Way. By 2016, we will be free and clear of the Dark Rift and its highly, transformational and awakening effects. The light is already shining brightly at the end of the tunnel, and we can see it even though we are not sure what it means just yet. We were in the Maya World over the 12/21/2012 dates. 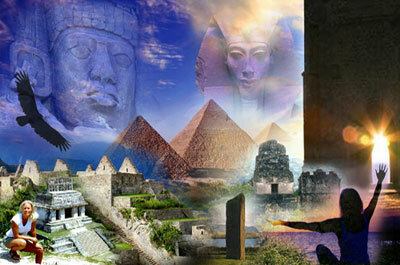 We traveled through the five elements of the Maya world, in five sacred temple sites and in three different countries. This pilgrimage was one that was just as unique as the times that we are moving into. We experienced wide ranges of human and spiritual experiences all at the same time. The intensity of this potent time created everything from jubilant celebration to varied body issues as we traveled through our two week pilgrimage. 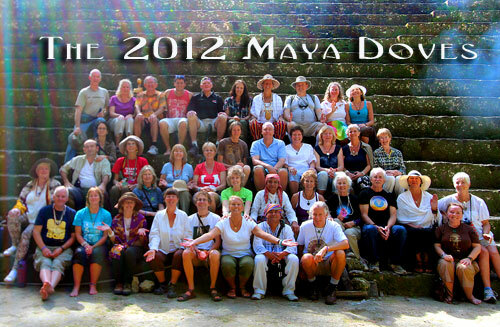 I know many of you want to know what happened on our 2012 Maya pilgrimage. So I am going to make an attempt to share a little bit about our experiences, and then post the recorded messages in the weeks to follow. Nothing I can say will truly touch the truth of our experiences, and I just hope that by sharing this that some of the energy will transfer to you by resonance and osmosis. 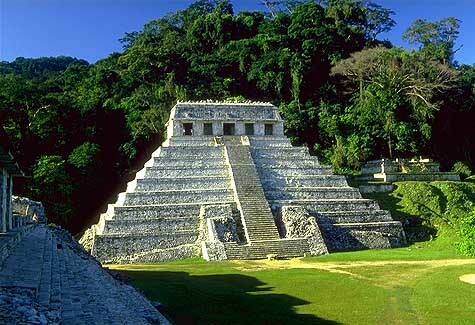 On December 21st, we were in the amazing site of Palenque. It has always been my favorite place on Earth. The energy was electric and highly charged. The energy was also quite frantic. It was hard for us to hold our focus as the energy shredded up and spit out the last of our old selves. Many groups, from new age to indigenous, were in Palenque for ceremony, celebration and closure of an age, a time and an era that we will never forget. We did not go through this day without our tests from spirit. We were tested to choose one or the other . . . the world of illusion and comfort, or the world of truth and commitment. As we boarded the bus, our local guide (that we were legally responsible to have for a group of our size) said that the traffic into Palenque was backed up for miles, the gates were shut, and they were not letting anyone into the site. He also shared rumors that the police were all out in force, with barricades everywhere, because a group had threatened to walk into Palenque the night before and take over the site. In his eyes, Palenque was shut down for the day. End of story. Enrique and myself were dumb founded as to what to do, and our local guide was frantic, fearful and no help at all. After a few minutes of talking about plan B and C, etc…, Enrique and I realized that our local guide was the source of the problem. Enrique and I know that Spirit always gives us space, because Spirit can see our hearts. Enrique looked at me and said . . . "Well Aluna, I guess we have to do it our way." So we did! We both stepped out of the fear projected on us, and returned to the present moment. We decided that we would simply take the bus to the gate, and let Spirit take care of the rest. As we drove the few miles to the site, we encountered no traffic jams and no police barricades, and took our really big bus up to the back entrance just as we both foresaw! No problem. We walked into the site up a jungle trail into old Palenque, which is the most sacred way to enter the city. We stopped about half way up the back trail into Palenque. In this area of Palenque, there are myths and memories of Jeshua giving baptisms in the water falls. Here we were asked to let go of our past. We were asked to die and bury our old ways. We could feel the assistance of the guardians with us. Here the rebirthing and rebuilding of ourselves was beginning. The entire time that we were doing this, a parade of other groups were coming up the back trail as well. Some wore elaborate costumes, and others were simply clothed with light shining from their eyes (the full message coming soon). Then we entered the main area of Palenque. We were called to stop at the ball court where the Star Elders taught the lessons regarding time, space and dimension. I used my body as a dousing rod to find the right spot. We gathered under the pouring rain and quickly stuffed our valuables under our rain ponchos. Here I downloaded the message for the day that just gushed out of me like it was under some kind of cosmic pressure. It felt like it was waiting a long time to be uncovered. I was relieved of a great pressure (the full message coming soon). See Palenque in the pouring rain here We didn't take many photos on this day. You can guess why. YES? The Star Elders instructed me to make a sacred site essence that came from the sky. They said that this new sacred site essence would embrace a higher octave of divine intuition and the purest realm of living knowledge. They wanted this to be a cosmic essence that was created from the new frequencies descending from the great central sun, and not of the Earth at all. I was confused, because they said this site was anchoring the element of water, the foundation of pure creation. But then we got it . . . the water came and came and came. I never saw it rain so hard. The entire site became a huge water fall. It was like standing in the middle of a huge water fountain. It felt like we were pressure washed by God, and purified by new frequencies. The rain was gratefully welcomed by our group, and not resisted. We didn't go run for cover, because we asked for this. We were committed to being there. We stood there deliberately, received the purification and let go of our past. We were born anew. The essence was made from the falling rain water that had yet to touch the Earth . . . rain filled with the new frequencies of this new age that we had just entered. Later that in the afternoon, there was a huge flash mob of all kinds of people singing about peace and love. See the LOVE FILLED Video here. This kind of ceremonial activity is not allowed in sacred sites in Mexico, yet the guards stood by and enjoyed the energy as well. Let's face it; there was nothing they could do anyway. Then the sun came out! The purification and rebirth was complete. It appeared that only spiritual groups would tolerate the torrential rain on this day . . . a day that could have been a very crowded mob. Spirit gave us space once again. When we boarded our bus to Yaxchillian on December 22nd, we could already feel a new peace being restored to the Earth. The uncertainty of 2012 was already fading into hope, and the anticipation was shifting into self-empowerment. We took a boat down the Usumacinta River to the earth element site of our pilgrimage. It was time to anchor the water to the earth. Yaxchillian means forever young, forever green, new beginnings, or a place of green stones. The green represents the new full bloom of our evolution, where one is totally integrated, mature, vibrant and fully alive and conscious. Today, Yaxchillian was in the first day of a new era. It was Baktun 13.0.0.0.1. 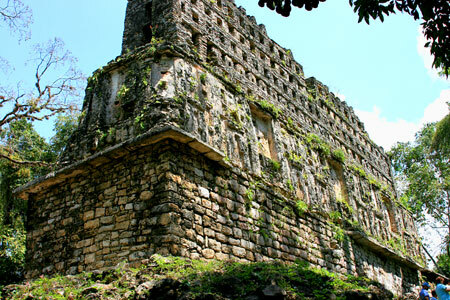 When we entered the site, there was a sharp contrast to the energy that we felt in Palenque the day before. Palenque was buzzing with the culmination of an entire age. Yaxchillian was soothing and deeply calm and peaceful, like a new born baby. We could only whisper as we entered this site. The energy was that holy and pristine. We could feel the heart of the Earth mother cradle us in this new energy. We were being bathed in the first day of a new age inside the most remote and energetically pure sacred sites in the Maya world. It was like a new part of us was coming home to Earth. (the full message coming soon). When I planned this pilgrimage, I knew that we were to be as un-plugged as possible from the modern world. We were as far out as we could get without catching a ride on a burro. That afternoon, we crossed our first border into Guatemala on the other side of the Usumacinta River. It is a border very few cross, as it is in the middle of nowhere. We traveled the rest of the day and early evening to Tikal. The hotel staff was so kind to keep dinner waiting for us. It was a long day. By this point, our group had already absorbed so much energy that the pilgrimage began to blur into a field of experience that had no time or space attached to it. We lost track of the days, and memories of prior days felt like it was months before, or maybe a weird dream that we had. We felt rudderless; like no one was steering the ship. We were guided solely by the new energy that we were being bathed in, but had yet to understand. Yet we were all OK with this extraordinary new dream-like space that we were in. Tikal holds the element of fire and teaches authentic power. But Tikal had shifted greatly and now holds a higher octave of peace and heart that was not present before. This heart energy was palpable. It became very evident that Tikal had evolved into a new realm. It was now emanating a sophisticated and complex new octave of divine authentic power that brings about a deeper understanding of the new laws of nature. We didn't know what to think or feel about the changes that we felt . . . after all, we were new borns. Our dear brother, Maya Elder Rigoberto had cancelled his Kiche fire ceremony with us due to health reasons. Enrique and I wondered what to do. Maybe we would do our own type of Maya Ceremony. But by chance, the local Itza Maya Elder, Filfido Chayash, was available to join us. He was very pleased to join our group, and welcomed us with a great open heart. He performed a beautiful fire ceremony at the base of Temple #5 in Tikal. We made a sacred site essence during the ceremony that embraces a higher octave of divine authentic power from the element of fire and brings about deeper understanding over new laws of nature. That night, the staff at the Jungle lodge prepared an awesome Christmas dinner for us. The lodge was decorated with Palm fronds. Love filled the room, and we gave them a standing ovation for their efforts. Afterwards, some of our group got rowdy (those Aussies are always trouble) and danced aboriginal dances and sang in the lobby. Our trouble maker Aussies and a few followers did an aborginal dance to Hunab Ku in the lobby - See it here. On Christmas Day, we boarded our Christmas bus that we had decorated with Guadalupe flags and Christmas garland. We traveled toward Livingston, Guatemala. The only way to get to Livingston is by boat. We took an amazing boat ride on the Rio Dulce that was so beautiful that I felt like my soul was renewed. The canyons that we traveled through were breathtaking. In Livingston, the staff at our little Caribbean hotel offered us a Garifuna celebration with lively dancing and drumming. It was a beautiful day for integration . . . and at this point, we really needed the down time. We were already so full with energy and experience. By this point in our transformation, it became apparent that the energy was beginning to manifest in some strange body issues which we rarely see in the Maya lands Many right hip issues in the group came up . . . possibly from a perceived fear of nothing to move forward to, as most seers could not see past 2012 into 2013. Some people had stomach issues and nausea that was the new energy coming in which our bodies didn't know how to deal with it yet. A few had energy fevers that came from the intense downloads of energy which we were absorbing. There was just so much to process that we had to let go, and just allow the process. On December 26th, we traveled to yet another favorite sacred site of mine, Quirigua, the element of the air. It is known for its amazing living Stele. The feeling here is very ethereal and airy. This site was built for inter-dimensional travel. Maya Elders confirmed a memory that I had which was that this was the last known site where the Star Elders were still in human-like form. The site was built with a lot of quartz crystal, maps to other dimensions and cosmic locations, and directions on how to make the journey. Today the living stones really shared with us. This was new to me as the Stele, in the past, would not speak to me until it was time. They do not give up their wisdom easily. It was obvious that this day was in fact TIME! We received a bit of transmission from them. Each of the Stele in this site hold different keys to the new world, and many were already transmitting and planting seeds into us (full message coming soon). 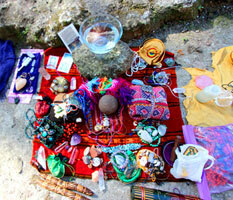 We were being called to give back to the Earth, at this powerful convergence on the Maya grid. 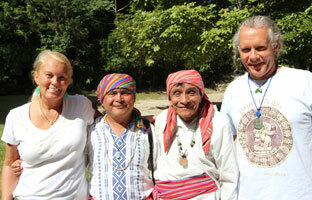 We offered a heartfelt ceremony in Quirigua's small plaza. We sent our love and blessings to the earth, to the sky and to all living beings. Here we made a sacred site essence that embraces a higher octave of limitlessness in a human form, from the element of air, and holds the codes and map of the physical voyage between dimensions. Copan - The Element of ETHER and Emergence After our visit to Quirigua, we crossed yet another border into the country of Honduras, and landed for the night in the peaceful little village of Copan. The Copan Marina is the only hotel I will stay in while in Copan, because it has such a nice spirit about it. But we slept restlessly that night as we were already in the energy field of Copan the temple site. It was intense. 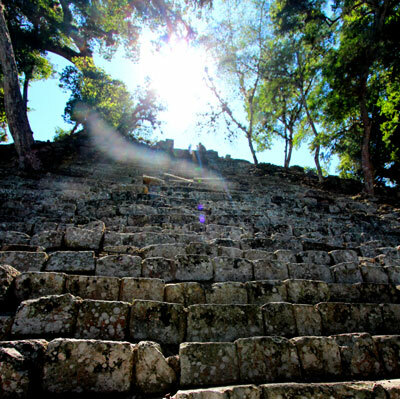 Copan represents the element of Ether, and I find it to be the most powerful site in the Maya world. We entered the sacred site on December 27th and on the 28th. We like to take 2 days for this site, because the energy is so intense that we cannot stay in the site very long. The energy was SO strong the first day that it rocked us all. I felt my tummy do a flip flop before we even got to the front gates . . . like morning sickness. We were being invited into a new temple that was much larger than who we were in that moment. It was sort of like when you get an enormous offer from someone you truly respect, but you have that little negative voice inside yourself saying that you didn't earn that position. It was humbling and empowering all at the same time. Yet here we were, being invited into this temple site. We were out of our comfort zone for sure. It was like the holy grail of Maya energy. We were walking into the etheric record of a new world. There is no category in which I can place this feeling. This is the place where we can birth a new world, and we could really feel it. First we went to the living Stele on the left hand side of the site. This is where we received a download . . . a message from the standing stones who had not given up their wisdom easily in the past. Today they were quite open and sharing. It was time (full message coming soon). Then we were asked to move to the hieroglyphic stairway. This stairway is a dimensional doorway where trained initiates ascended, with great care, into the great central sun. This story was told to me by a Maya Elder back in 1996, when the comet Hyakutake was visible in the night sky over Copan. 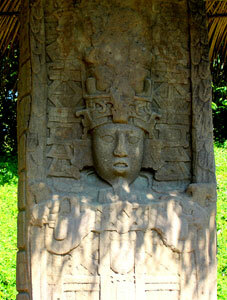 The Maya Elder's name was Eusebio Leon Chebo Leon, and he lived in Copan his entire life. He was so old that his eyes had turned blue. He was a just child when the famous archeologist, Sylvanus Morley was in Copan excavating the site. 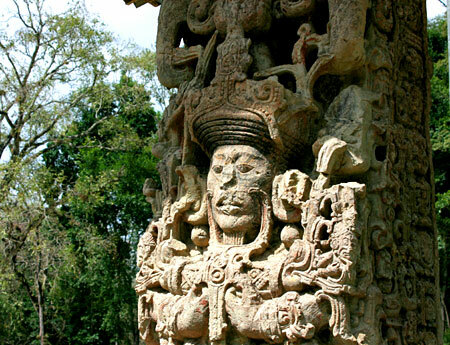 Every single day, he would travel to Copan's temples. When I met him, he had picked me out of a crowd of tourists to tell me this story. The story changed me in ways I still do not understand. As we approached the hieroglyphic stairway, we could feel the energy rush down the steps. We sat there for a while absorbing the energy. Some of our group had to move away, because it was too powerful. It is always good to listen to your heart and not burn yourself out. It is good to receive energy in stages. We knew that we would return back to the site the next day for more. The next day we entered the site again. This time we could stay longer. We noticed that another stairway to the right of the hieroglyphic stairway was also activated. On top of this stair way, was a huge, old, split Ceiba Tree. The Ceiba Tree is sacred to Maya cosmology, and represents the tree of life. This was the very tree that Eusebio pointed out to me back in 1996, as one of his favorites. He said "It was only this high when I was a boy". He held his hand out about chest high. Today, I finally got why it was so important. The tree has split in two which marks a place where there is an earth acupuncture point or vortex line. Instead of the tree growing up toward the sun, it bowed down as if to pay respect to the temple which it was shading below. I stood at its base for a bit. Then I noticed a couple from our group had positioned themselves dead center between this stairway and the hieroglyphic stairway in the plaza below. They began to do a ceremony. This is not allowed in public sacred sites . . . yet the guards decided, after a bit, to look the other way and let them do what they came there to do. I climbed down to the base of the stairway and took the usual tourist photos and discovered an apparition of a spirit descending the temple steps. (See Photo) Here I was called to make a sacred site essence of the element of ether that embraces the next higher octave of living mastery / emergence, from the element of ether, and it brings about the culmination and birth of all five newly evolved elements needed to manifest the new codes of life on Earth. I made this essence between the base of the stairway and a living stele (Estela N). The guards were distracted by the girls doing the ceremony (thanks to Janie, Linda, and Carmel), so I was able to cross past the roped off area and begin the process of making the essence at the feet of the living stone stele. We all stayed in the site as long as we could and we left little by little as we felt complete. We had our closing circle that evening in a yoga palapa at the Hacienda San Lucas with breath taking views of the Copan valley below. We shared our experiences and said our goodbyes. We had our final dinner in candle light at the Hacienda. The corn soup is legendary. Now, as I write this, our pilgrimage feels like a dream to me. What took two years to plan and manifest, was over in a blink of an eye. What we gathered, learned and discovered could take the rest of our lives to unravel, unpack and integrate. The next morning, we all began another journey . . . the journey back to where we came from . . . home. I know that we didn't return home in the same recognizable form, but altered and distinctly refined, purified and prepared for the new that is coming. What this will be, no one knows in this moment. But I do know this . . . it will be what we make of it.